Teaching junior high students wasn’t in the cards for Bob Perkins. Trying out his hand at professional tennis was fun, but he knew it wasn’t a long-term career. So when his friends told him his outgoing personality would make him a good fit in sales, he listened. And, despite a rocky start in his first sales job, it turns out they were right. 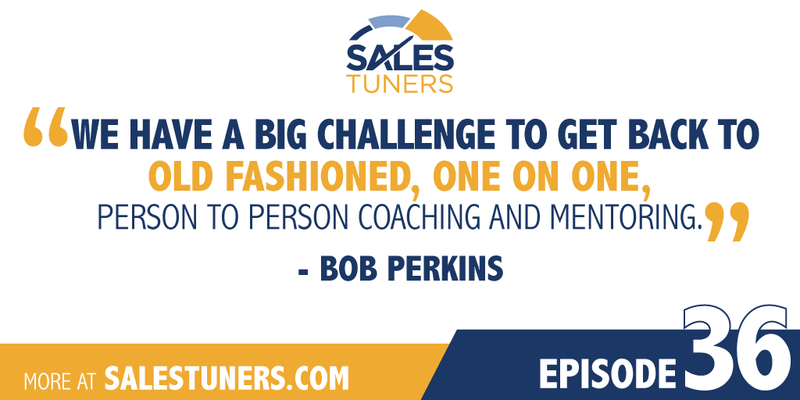 Bob is the founder and chairman of the American Association of Inside Sales Professionals (AA-ISP), an organization he formed to advance a profession he’s become quite passionate about. AA-ISP is dedicated to making salespeople better at what they do, in essence putting Bob’s interest in coaching, training and teaching others to use. Bob is a firm believer in prioritizing education and training in the workplace however and whenever possible. Good training is out there, and it’s more important than you think. Why? Because even if you have the heart and drive to succeed, Bob says sales should never be an island. Instead, ongoing personal training and development are crucial to success. Be Selfish In a Good Way: Top sales reps are usually at the top for a reason. They’re driven, focused and selfish – in a good way. They’re also not that concerned with the welfare of those around them. They need that time and space to focus on their accounts, run their sales process the way they know works, are dedicated to improving themselves all along the way. Embrace the Digital Transformation: The role technology plays in sales isn’t going away. You can easily schedule meetings with apps like Calendly or completely automate it with services like X.ai. You can streamline the workflow for creating proposals with apps like our sponsor Octiv or simplify your outbound prospecting with tools like SalesLoft. There’s even a new product I recently demoed that brings better transparency and consistency to the discovery call process called Costello that you should check out. Keep Sales Personal: Time to contradict myself a bit. Even though I believe we have to embrace the digital transformation, understand we are at the risk of de-personalizing sales. All the tools, data, and analytics should be leveraged when appropriate, but at the end of the day, people buy from people they like. Differentiate yourself from the both the AI movement as well as average sales person by showing your personality. Flip on the switch for your webcam and ask your prospect to do the same. Write emails like a human being. Truly participate in the “social” part of social media.